Some days I want to be a kid again. Life was easy. I look back fondly on the products that would make me happy. One of my favorite times is watching Saturday morning cartoons with a big bowl of cereal (that I fixed myself, of course). I'm not sure why this specific memory has stayed with me. Still as I watch my kids pour their own bowls of cereal on a Saturday morning, I smile. 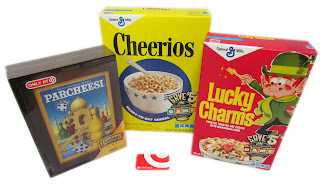 General Mills cereals and Hasbro have joined together to bring back the packaging that is so retro. Right now there are 5 different throwback packages exclusively on the shelves at Target (untile April 30 or while supplies last). . From Lucky Charms to Cocco Puffs, the designs that I remember as a child are back for a limited time. Participating Big G cereals include: Cinnamon Toast Crunch® (16.2 oz. ), Lucky Charms® (16 oz. ), Honey Nut Cheerios® (17 oz. ), Cheerios® (18 oz.) and Cocoa Puffs® (16.5 oz.). Now I can share the traditions of my youth with my kids. Please use the Rafflecopter to enter. I like the Lucky Charms. I always liked Lucky Charms! My son loves Cinnamon Toast Crunch. But myself, love to eat the Cocoa Puffs! The Cocco Puffs I am a sweet cereal kind of girl! I'm excited to see the Honey Nut Cheerios. Thanks for the giveaway! I'm excited to see Lucky Charms. Lucky Charms is my choice. Cocoa Puffs! I loved that crazy bird. Lucky Charms. They were a favorite at our house. I am most excited to see Lucky Charms and Cocoa Puffs! I have loved lucky charms since I was about 5 yrs old.